I’m using the term Canadian English quite loosely here. Canada is a huge country (9.985 million km² to be exact), so while we definitely have our very own variety of English, the same terms aren’t necessarily used in every province or territory. The terms listed here are what I’ve used growing up in Southern Ontario. I’m not saying they’re never used elsewhere, but they’re commonplace here, and not always understood by our international friends. This is a pretty decent list, but it’s not a complete list by any means. This is one of those words that pretty much all Canadian English speakers use, and it wasn’t until maybe eight or so years ago when I realized that pencil crayons wasn’t the “norm”. My co-workers in Japan were mostly American, and I can clearly remember the day when we were working on creating something, and I asked them to “pass the pencil crayons”. 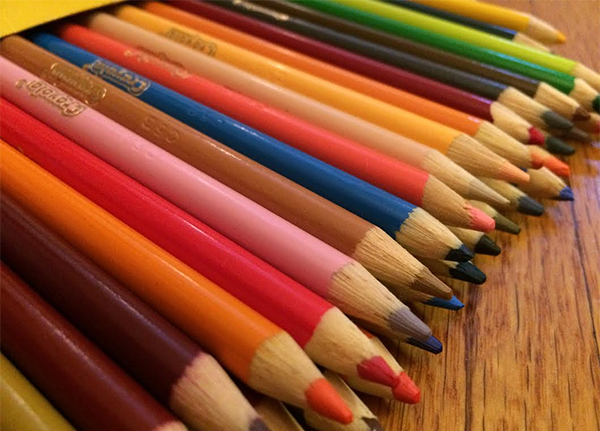 They pointed between the (wax) crayons, pencil crayons, and pencils, bemused, until I gestured to the box that I wanted. The box of, as they say in apparently most other varieties of English, coloured pencils. It’s finally spring, and the last remnants of snow are rapidly melting away as the city heats up with balmy temperatures that are finally above zero. With the change in season comes one thing in particular to the Niagara region: tourists. 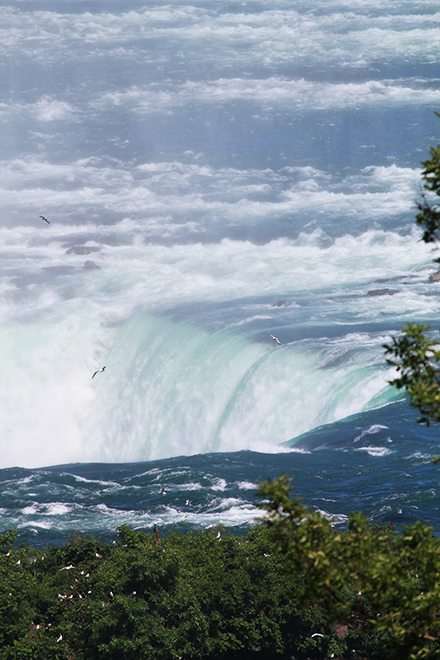 Host to over twelve million tourists every year, Niagara Falls is still one of the most popular vacation destinations. The falls is divided into two sections; the Bridal Veil Falls (the American Falls) and the Horseshoe Falls (the Canadian Falls). Despite my bias being Canadian, our side does have the better view. I’ve spent a great deal of my summers working in the city of Niagara Falls, answering questions and sharing information. It’s easy to find information about the falls themselves, but sometimes those questions which you think would be common sense go unanswered. And hey, it never hurts to ask. So here are the answers to eleven (or so) questions that I get asked pretty much every summer. Even though we’ve passed into the New Year, and are making our way to new seasons and new holidays, if you’re ever looking for a tea that gives you that Christmas feeling, Steeped Tea’s Harvest Spice is perfect for that. Harvest Spice is a black tea with cinnamon pieces, cloves, and jasmine buds. While the name hints at autumn flavours, I find the cinnamon and clove strongest, which gives it that Christmas taste. It leaves that pleasant tingly cinnamon taste at the back of your throat when you drink it. Today, I want to talk about the traditional afternoon tea that I went to with my Grammy this past weekend at the Prince of Wales in Niagara-on-the-Lake for her Christmas present. The Prince of Wales is a beautiful old hotel that was established in 1864, and they offer afternoon tea in the drawing room. We had a reservation, and when we got there we were asked if we wanted to sit inside the drawing room or in the solarium. It was a pretty gloomy and chilly day, so we chose to sit in the drawing room not too far from the roaring fire. Those of us who grew up watching The Price is Right know how important it is to spay and neuter your pets, thanks to the wise words from Bob Barker at the end of every episode. Unfortunately, Japan doesn’t have a television personality teaching viewers the importance of fixing their animal friends. It’s not that it’s not done in Japan, but a lot of the people I’ve met with dogs haven’t had it done. Moving to Japan – What to bring? When you’ve made the big decision to move to Japan one big obstacle is packing and figuring out what exactly you need for your upcoming adventure. Everyone has their own list of necessities, but here are some of the things I suggest bringing – and reasons why. Back in June, my cousin and I headed down to Safari Niagara to check it out, and take some photos of the animals. It was my first time there, and I wasn’t too sure what to expect. The only thing I really knew about it was that a bear had escaped years ago, causing quite a bit of panic. There’s free parking at Safari Niagara, which is great for families, and the admission isn’t bad. We got in for free, because I had special tickets, but even if you have to pay full price, I think it’s pretty well worth it. They have a good selection of animals, and do shows at various times throughout the day. So first up, are my photos from the farm area, where they house a selection of stereotypical barnyard animals like goats, chickens, rabbits, and ponies, as well as my personal favourite, an alpaca. The majority of my photos were of the alpaca, because he was just so awesome. The smirk he had on his face totally made my day. No matter where you are, it’s important that you scope out a good vet for your furry friend. When I adopted Rhea, I did a lot of research on what vet to take to her to. So I read a lot of online reviews of veterinarians in the city, and ended up choosing a long running vet with a state of the art facility, and amazing reviews. It also turned out that the vet had been there for forty years, and judging by the staff board, both the father (who I assume started it), and son worked there. When asked to name a Japanese food, it’s a safe bet that a good number of people would quickly say sushi. Sushi is easy to get in Japan; you can go to a sushi restaurant, buy it in the grocery store, or even get it at the standard convenience store. Even though I don’t eat seafood, I really wanted to give 回転寿司 (kaitenzushi) a try. I didn’t want to leave Japan without going to a conveyor belt sushi restaurant, so I asked some friends if they wouldn’t mind going with me, and they were more than happy to oblige. As it turns out, even if you’re not a seafood fan there are a lot of options for you. So don’t let that hold you back! We decided to go to a chain restaurant called スシロー (Sushiro), and while this isn’t necessarily how all conveyor belt sushi places are, this is my experience. Purikura (プリクラ) is an abbreviated form of Print Club (プリント倶楽部), and the booths were first out in 1995. You go in, take a bunch of photos under a time limit, get a few minutes to decorate them, and then pick up your freshly printed copies which can double as stickers. Nowadays the booths have a whole slew of features, with skin lightening and eye widening being two common ones. So how do you go about doing some super fun purikura?